In the streets the most absurd, the most trivial situation may be frozen up and become a scene in your imagination and eventually end up more or less fortunately imprinted forever on a photograph. Some of those scenes acquire more meaning or are better off in black and white or sepia. I don't know why is that so. Have you ever wondered why the lack of other colors turns a photograph into something more artistic, more symbolic, more serious perhaps? And wondering about that, why is it that after ten or twenty years, that significance grows exponentially. For example, I am somehow sure that this modest snapshot of a random guy showing off his brand new Mexican hat along the Rambla de Mar bridge near Maremagnum center, looks better in black and white but I am convinced that twenty years from now (not that it is meant to turn into a famous picture) this trifle, brief moment in time, will evolve into something more artistic, into a sort of message from the past, talking about other times, other people at least to me and my family. It is evident that black and white gives value to images because in our imagination we associate faded, blurry, noisy, black and white images with the past. And curiously enough, although recent generations have been surrounded by color photographs there is something there in the back of our minds that makes the association persist. Maybe it is something about chromatism, dreams, the subconscious mind...who knows. 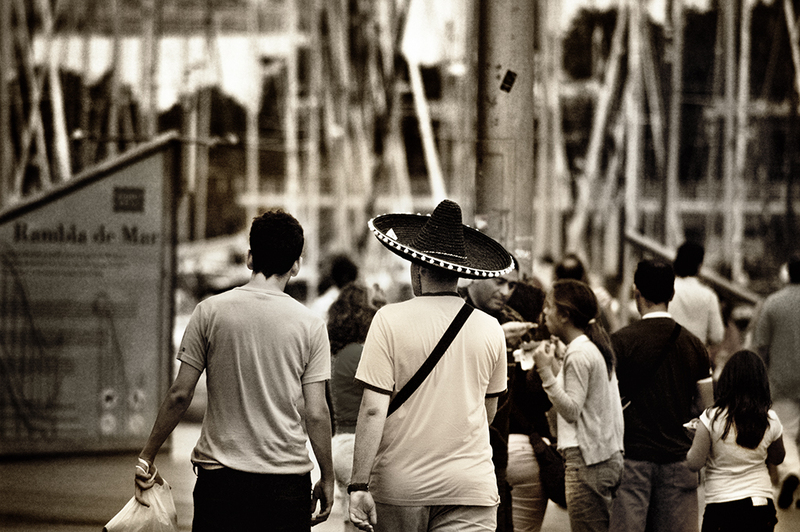 Here is a link to a previous version of someone else wearing a Mexican hat but this time in color: Mexican Hats in Barcelona. I suppose you get quite a few tourists from Mexico and other Spanish speaking countries? We do, but something tells me these were not. They may be from other cities in Spain that bought the hat just for the fun of it. Thanks for the comment Leif. I like the b&w and think that you're right - the scene is better in monochrome. for a moment I thought this is a photo from the past. B&W definitely cheating my mind. Thanks ical. That's very kind of you. Beautiful B&W, Carlos. I like the tones very much. Wise words. I hardly ever do or am asked to do sepia tint. I find it works with older building an vintage clothes etc but not on say modern car, whereas black and white is timeless. Classic image and thought provoking text. Lo que me gusta de esos lugares es que oír castellano o catalán es algo extraño. Una bella Babel junto al mar es Barcelona. Preciosa foto. Necesito permiso para pegar alguna. Your musings are interesting and are food for more thought on my part. I checked your link, and I find that I look both photos, each one for specific but different reasons. Yes, B&W often seems more dramatic and timeless but I also like colour since it is so realistic. -En cuanto al anónimo. Gracias por el comentario. Eso de :) quiere decir que uno está contento, happy o que lo que dice es de buen rollo. Me agradaría decirle que sí pero claro si no sé a quién es difícil. Mis fotos tienen licencia de Creative Commons. Se pueden descargar y usar personalmente sin ánimo de lucro. Es decir se la puede poner de fondo de escritorio, hacerse un cuadro para su casa, pero nunca venderlas o reproducirlas en algo que dé o implique dinero. Si las usa online, en una web, basta que haga referencia a mi persona como su autor. Sí es a través de un enlace mucho mejor. Y ya está. That is an interesting photo and posting. I'm dubious about black and white in modern photos. Some photos are great others not so. When my grandchildren looked at some of my old photos of when I was young they asked why we lived in black and white. They wanted to know why there wasn't any colour around when I was little. Well I have to say there wasn't much colour just after the war. Maybe that's why I love colour now especially in photos. You are right Winifred. I know what you mean. Although I was born in the sixties I never saw too much color when I was young. I thought that was normal. In the seventies I got to love color and I still do. Some are great in BW and some don't. But in general as a rule of thumb, BW gives them this classic touch and there must be a reason I guess. I wonder what will happen in 20 or 30 years. From an aesthetic point of view I prefer BW. Thanks!